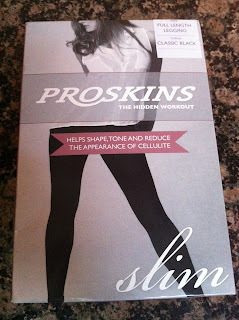 For best results, you're supposed to wear your Proskins Slim leggings every day, for at least 8 hours per day. That sounded pretty absurdly undoable to me until someone suggested wearing them as PJs. I'm not usually a big pajama girl, preferring gowns, but I have been very impressed with how comfortable Proskins are to sleep in. First off, they are incredibly lightweight and smooth. So smooth that you will feel an almost uncontrollable urge to fondle your thighs. Seriously. They're slippery like spandex but they don't feel like sausage casings to wear. They're very comfortable, like a second skin. The active ingredients that permeate the compression fabric are cooling, so you don't wake up sweaty. I kind of wish I had a matching Proskins top to wear to bed. As far as the effects of wearing the leggings every night go, I have noticed that my skin is softer and smoother. I haven't noticed a dramatic slimming effect yet but I'm hoping! I did have to hand wash them after an unexpected monthly visitor came early. Ahem. They took a long time to dry since we've had high humidity this summer. I'd love to get a pair of the Slim Galaxy and Slim Floral leggings to wear with dresses this fall. Particularly if they shave a couple of inches off my thighs. I'll keep you posted. In accordance to the FTC Guidelines and the WOMMA Code of Ethics, I am disclosing that I received a product sample to facilitate my participation in this program. No compensation was provided. All opinions are, as usual, entirely my own.